Save the date cards - Why should we do them? The cards alert your family and friends about your special day before you send out the wedding invitations. If you are having a destination wedding, this card proves invaluable. Your guests can request time off from work if needed (especially if your wedding is during the week) for travel. When I design a save the date card for one of my couples, I utilize one or two of the images from their engagement shoot. Using a recent photo is great, especially when you send it to relatives that might have all your photos from grade school or the relative that has not seen you in many years. Include your name, wedding date, and any other important information about your wedding - especially if the wedding is out of town, is more than one day, or is not on a Saturday. Remember, the main intent with save the date cards and invitations is to alert your family and friends of your special day so they attend your wedding. Correct? 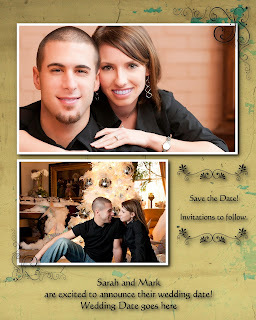 Have fun with your designs and enjoy your wedding planning!